The R&B singer was backed by surprise guests: Saturday Night Live alum Maya Rudolph and jazz singer Gretchen Lieberum, who are in a Prince cover band called Princess. 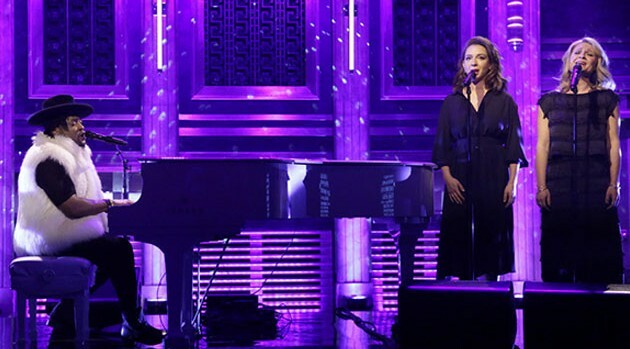 Rudolph and Lieberum previously appeared on Late Night — then hosted by current Tonight Show host Jimmy Fallon — back in 2012 and performed Prince’s “Darling Nikki,” backed by Fallon’s house band, The Roots. Prince died at his Paisley Park estate in Chanhassen, Minnesota, last Thursday at the age of 57. An autopsy was completed Friday, but a cause of death has yet to be revealed.